Everything old is new again! Today Northlands announced that the annual Edmonton summer fair will henceforth be named K-Days. The "K," however, won't necessarily stand for Klondike Days as it did in the halcyon days of my youth. According to the Edmonton Journal story linked above, Northlands is going to figure out a theme to surround the K-Days name. Perhaps the venue will extend one full kilometre. The organizers could develop a theme of eclectic madness: Krazy Days. Or a movie monster theme: Kong Days. Personally, I think the fair should be called Frontier Fest or Gateway Days. But I haven't been to K-Days/Capital Ex since 1991, so my vote doesn't mean much. I suppose it doesn't really matter what we call the fair as long as people have fun. And Sean certainly looks as though he was having fun back then! You will have to please remind me why the "Klondike" name got dumped in the first place, and why it could not just go back to that. 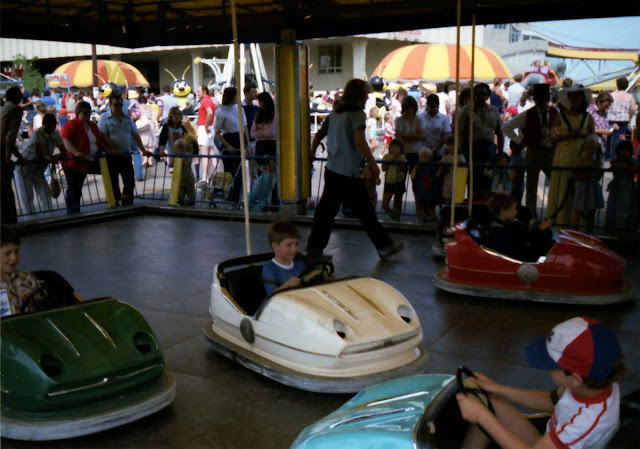 Interesting that the article says that the original name was "Edmonton Exhibition". I guess that one made too much common sense to keep. As for the photos, that might have well been me in that Montreal Expo's cap (except that I was living one province over when that pic was taken). I loved that hat. 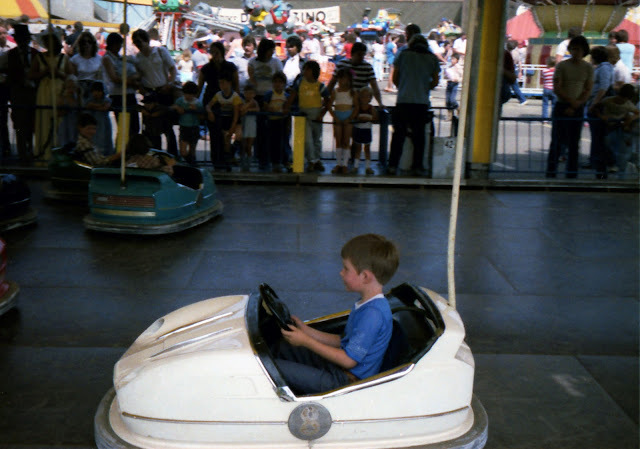 And I loved bumper cars as well. If that was really me in the photo, I would have lined up Sean for a walloping front-end collision just off the long axis. That way the victim kid spills around inside the car cabin like dice in a Yahtzee cup. Fun!